Blow guns, airline couplers and connectors, compressed air guns, air blow guns. These are just a few popular air control products. Quick disconnect couplings and plugs are available in many additional series and sizes. Please contact us for a more complete catalog if you are interested in other air accessories and fittings. WARNING: Proposition 65 Label for all airline accessories shown below. Safety blow guns meet OSHA requirements of special relief holes in nozzle to limit pressure to 30 PSI when dead ended (static pressure). 1/4" NPT air inlet. 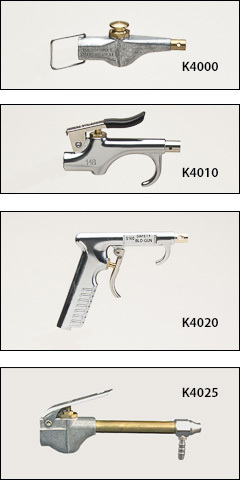 K4010 includes hang-up hook, safety nozzle, and a non-safety rubber tip nozzle. Rubber tip not shown in photo. 10/box but sold in any quantity. is easy to use. 1/4" NPT air inlet, 1/8"-27 NPS nozzle threads, and 150 maximum PSI. Zinc die-cast with chrome plated body. for use with liquids. O-ring seal creates air-tight connection. 1/4" NPT air inlet and 150 maximum PSI. Basic flow size defines the air handling capacity, not the inside or outside diameter of the threads. For example, the outside diameter of a 1/4" male NPT (national pipe thread) plug, measures approximately 1/2". All of the following items are made in the USA and have these specs: 300 PSI maximum inlet pressure and 250° F maximum temperature. ¼" basic flow size, M style industrial interchange. Maximum airflow 40 SCFM standard cubic feet per minute. Couplers are brass, with brass sleeves and Buna-N seal. Connectors are case hardened steel, plated to resist rust. Complies with military specifications MIL-C-4109. Sold by the box, 10/box. ARO style. Maximum airflow 34 SCFM standard cubic feet per minute. Couplers are plated steel with Buna-N seal. Connectors are case hardened steel, plated to resist rust. Sold by the box, 10/box. industrial interchange. Maximum airflow 90 SCFM standard cubic feet per minute. This size is not intended to be connected or disconnected under the normal line pressure. Couplers are plated steel with Buna-N seal. Connectors are case hardened steel treated to resist rust. Sold by the box, 5/box.